The Fantastic Four (1979) | 'TAIN'T THE MEAT… IT'S THE HUMANITY! In 1974 Fireside Books published a collection of reprinted stories featuring characters from Marvel Comics’ popular back catalogue of stories. Origins of Marvel Comics by Stan Lee, now widely considered to be the first trade paperback, was such a success that three more volumes followed between 1974 and 1977. 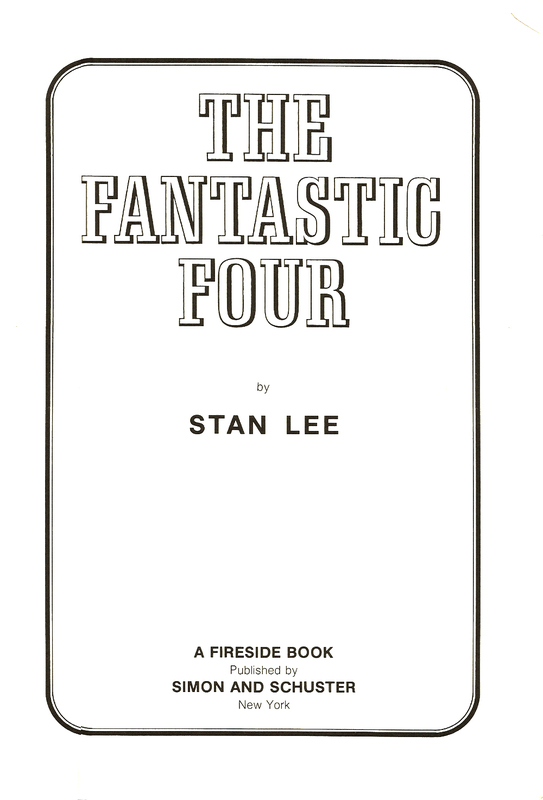 With these four books began a fruitful collaboration between the two publishers that over the next five years saw the publication of a wide diversity of titles featuring Marvel characters including a second set of reprint books; The Fantastic Four by Stan Lee, published in 1979, is the fifth title of this second wave. 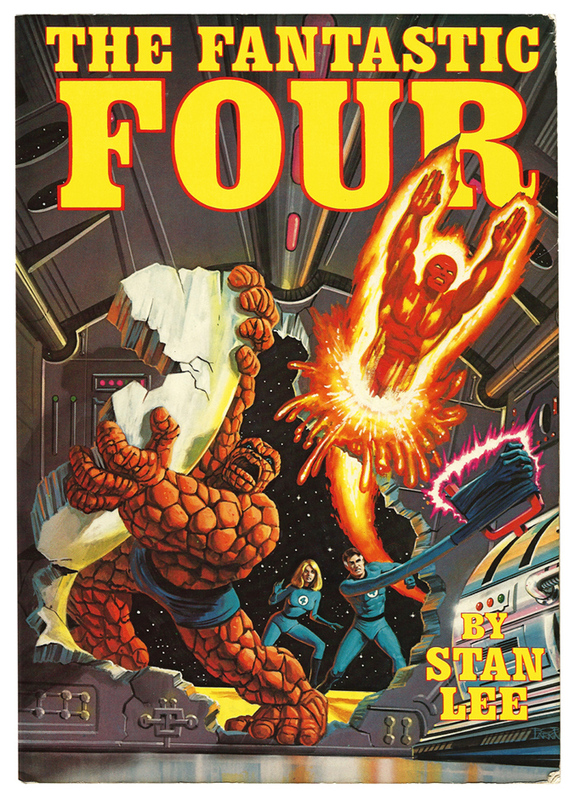 This volume continues the formula established by the previous entries in this series: a high quality full-colour book reprinting classic Fantastic Four stories from the Marvel Comics vaults, with a text preface, introductions and epilogue written by comic book legend Stan Lee. Lee uses his text pieces to explain the inspiration for the stories and to acknowledge the contribution made by artist, and fellow comic book luminary, Jack Kirby. There’s also a dedication to Carl Burgos and Bill Everett, the creators of the original Human Torch and The Sub-Mariner respectively, which is a nice touch. Lee clearly has a great deal of affection for The Fantastic Four, and well he should. The first issue of the comic ushered in a new style of comics, one where human interaction and frailty mattered as much, if not more, than the action. The comic was an instant hit with readers and would become the cornerstone of what would later be called “The Marvel Revolution” and the title’s success would directly contribute to the company’s rapid ascendancy to undisputed leader in the industry. 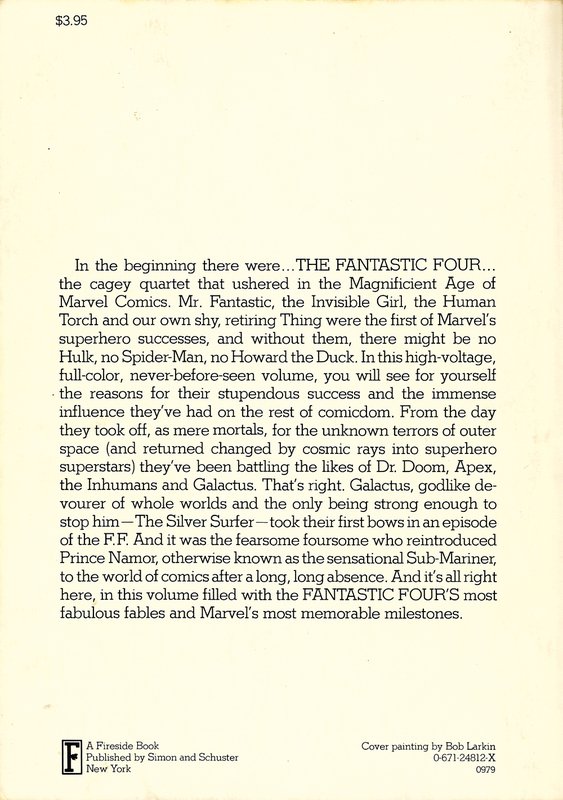 There are five stories reprinted in this collection: “The coming of… Sub-Mariner!” originally published in The Fantastic Four issue #4 (May 1961); “The Coming of Galactus!”, The Fantastic Four issue #48 (March 1966); “If this be Doomsday!”, The Fantastic Four issue #49 (April 1966); “The Startling Saga of The Silver Surfer!”, The Fantastic Four issue #50 (May 1966) and “The Power and the Pride!”, The Fantastic Four issue #87 (June 1969). The stories reprinted here are are bit of a mixed bag, ranging from the sublime to the prosaic. The undoubted highlight of the book are the reprints of issues 48, 49 and 50, or what is now commonly referred to as The Galactus Trilogy. 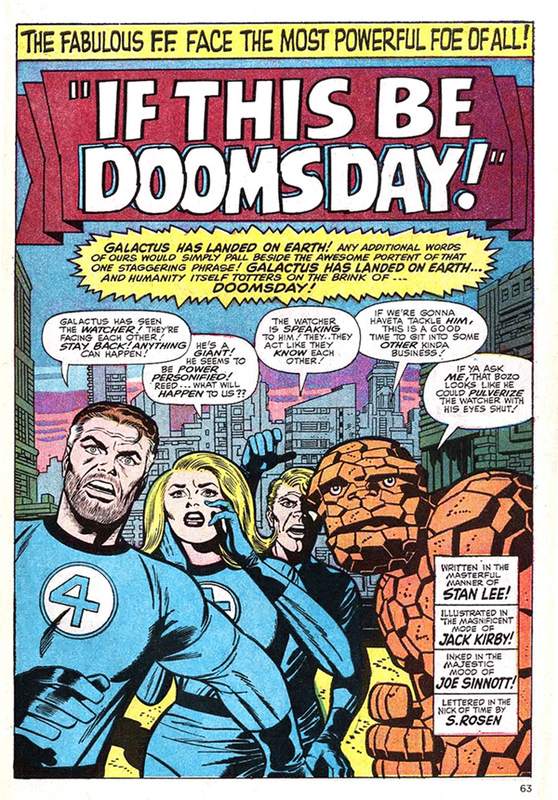 In the four years previous to this tale Lee and Kirby had steadily built up a rich pantheon of characters and stories, all of which helped to give The Fantastic Four an epic, multi-layered mythology. But with this three-issue story they transcended their best efforts and created a genuine, and enduring, comic book classic. Everything in this story is bigger: the threat, a timeless alien who consumes entire planets for food; the stakes, every life on earth; the solution, a breakneck race to the other side of the universe and into another dimension. The arc also introduced Galactus’ herald The Silver Silver, who would quickly become a fan favourite. I’ve lost count of how many times I’ve read this story and it hasn’t lost any of it’s power to thrill and entertain. However, the other stories included in this volume are a mixed bag. “The coming of… Sub-Mariner!” is a classic, of sorts, more famous for re-introducing Prince Namor into the burgeoning Marvel Universe. There’s plenty of action, a giant sea monster, an exploding nuclear bomb and the early signs of a possible love triangle between Mr Fantastic, The Invisible Girl and the Sub-Mariner. However the story has never been a favourite of mine and my apathy stems from my dislike of The Sub-Mariner and I’ve never understood the character’s appeal. The last story, reprinted from The Fantastic Four #87 is the weakest of the collection. It’s the conclusion of a story begun in issue #84 and basically consists of a giant fight between the FF and Dr Doom before the story eventually peters out without a satisfying finale. It’s an OK story, but nothing more than OK. It’s ironic that in his introduction to the Galactus story Lee briefly mentions the plot to “This Man… This Monster!” from The Fantastic Four issue #51, a story concerning a jealous contemporary of Reed Richards who disguises himself as The Thing to gain access to the Baxter Building and kill his rival. However, when both their lives are threatened, he is so overcome by Richards’ nobility that he sacrifices himself to save him instead. It’s a comic that has been heralded as one of the greatest FF story’s ever (amongst others, both John Byrne and Walt Simonson have cited the story as having been an influence on their work) and it’s exclusion from this volume is a real shame. However, the one good thing about the inclusion of “The Power and the Pride!” is that we get a clear idea of how much Kirby’s art style changed during his run on The Fantastic Four. His early work, although very good, has a fairly traditional comic book feel to it, reminiscent of other artists working in the late fifties and early sixties. But by the time we get to The Galactus Trilogy we can we see how his artwork has become more expressive and graphic, and by the book’s final story his heroic, grandiose style is in full swing. More than any other artist Kirby’s drawing style changed the most over his long career and this collection gives us a condensed chronology of his gradual transformation from talented artist to bina-fide comic book legend. Lastly, a quick word about Bob Larkin‘s painted cover. He paintedfour of the covers in the Fireside Books series and I’m sorry to say that this one is the weakest. I’m not quite sure why it doesn’t resonant with me as much as the others – maybe it’s because Mr Fantastic and The Invisible Girl are marginalised in the background while The Human Torch just looks wrong – but it’s a rare misfire from the talented artist. Next up: The Amazing Spider-Man by Stan Lee from 1979.